A hexiamond is a plane figure made of six equilateral triangles joined edge to edge. There are 12 such figures, not distinguishing reflections and rotations. They were first enumerated by T. H. O'Beirne. The compatibility problem is to find a figure that can be tiled with each of a set of polyforms. Polyomino compatibility has been widely studied since the early 1990s. 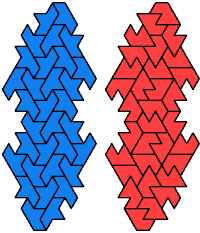 Polyiamond compatibility was first studied systematically by Margarita Lukjanska and Andris Cibulis, who published a paper about it with Andy Liu in 2004 in the Journal of Recreational Mathematics. While the journal was preparing the paper for print, I corresponded with the authors, supplying the missing hexiamond compatibility and some other solutions. My contributions arrived too late to appear in print, but I was listed as a joint author. This web page and my other page, Mixed Polyiamond Compatibility, extend and correct the solutions in the JRM article. 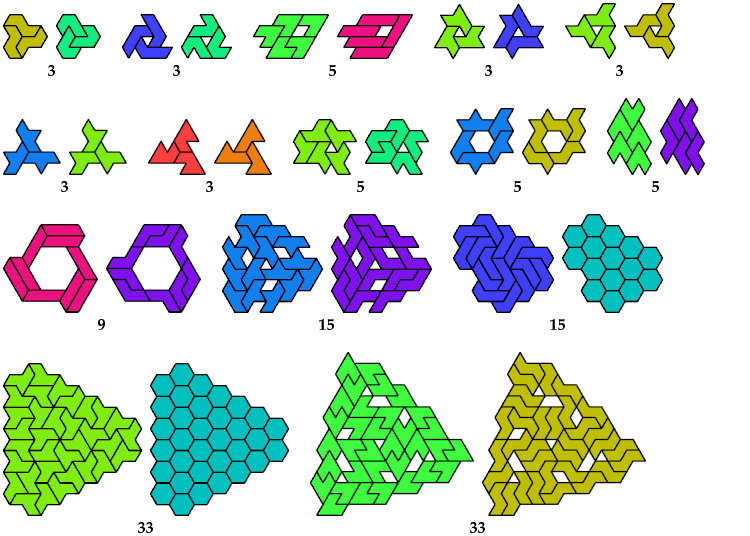 For sets of three hexiamonds, see Triple Hexiamonds. This table shows the smallest number of tiles needed to construct a figure tilable by both hexiamonds. These solutions are minimal. They are not necessarily uniquely minimal. This table shows the smallest number of tiles needed to construct a holeless figure tilable by both hexiamonds. Cells shaded in green need the same number of tiles if holes are allowed. These solutions are the smallest known. They are not necessarily uniquely minimal. I show only solutions that differ from the solutions given above.